Howdy! It's been awhile, hasn't it? As you may know from previous Design Notes posts, the ED team was reassigned earlier this year to AQ3D. Because of this change, EpicDuel hasn't seem many releases this lately, but it would be a tragedy of hum-bug-ian proportions if we didn't restore one of the game's most anticipated features: Gifting. We didn't have the resources this year that we had in past years to create loads of items, but we tried to bring back as much of the old magic as possible! First of all, Winter seasonal rares are available at Torgan and Edgar Boothe in Frysteland, so get them if you've been holding off for whatever reason. Also since this is an extended weekend, we're offering an extended Power Weekend! That means starting midnight tonight, you'll earn Double XP and Credits until Monday! You'll need all the credits you can get for what's to come! As of the writing, the 2017 gifting feature is locked-in and ready to go -- it's set to launch Friday, December 1st and last until December 31st! This time, the #1 prize will be Nightwraith's own personal Gamma Gear (Bike and Bot)! 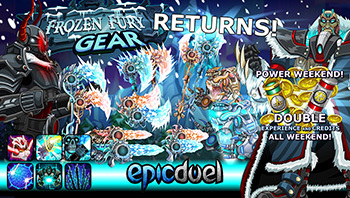 The top placing players will receive the new Cosmic Battle Yeti morphs! 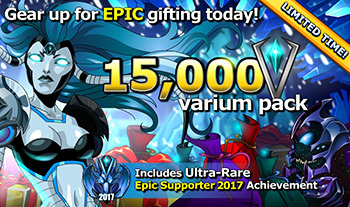 To help you prepare for gifting, we've returned the 15,000 Varium package and a NEW Epic Supporter achievement with purchase. Because we didn't want anyone who just bought Varium before the announcement to feel left out, we added the extra Varium and achievement for anyone who purchased the 12,000 Varium pacakge in November. This offer will be removed when the package goes live! The dates are changed, but the system remains basically the same. Thanks again, Beleen, for this epic video! Miss ya! How do you find the best places to give and receive gifts? 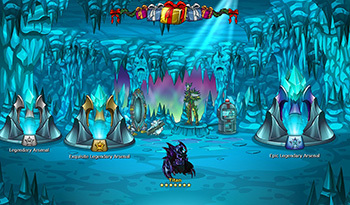 The EpicDuel gifting system is a very social feature so it pays to talk to your fellow players and use social media to find the hottest gifting spots and the best times to be online to get gifts. Please, please, please be careful of scammers who thrive during this time of year! Remember -- if an offer sounds too good to be true, it probably is! Have a safe and happy Thanksgiving and Duel On!